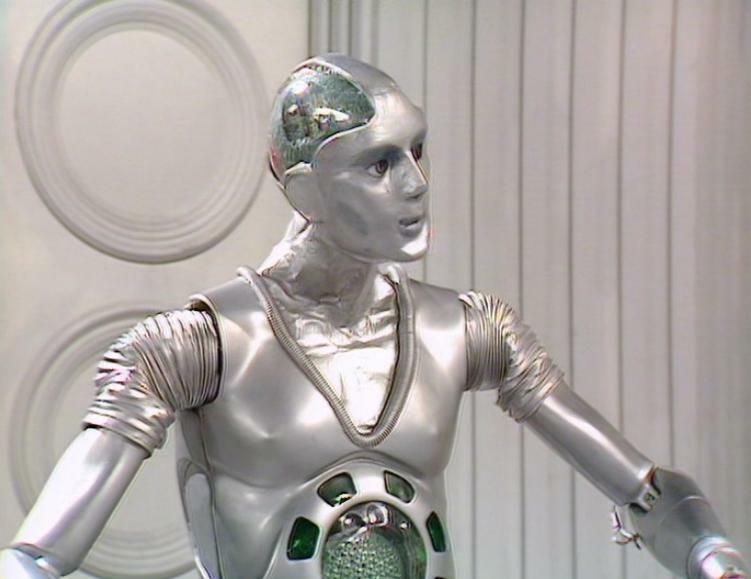 Kamelion was a companion of the Fifth Doctor who was played by a robot – a physical prop that would have lines dubbed over it, therefore allowing the actors something to interact with. I imagine he was envisioned as the new K9. The prop for Kamelion promptly broke and sadly the only man who knew how it worked died. The production team were left with a robot character they could rarely get to move. Even when he did, the robot was nothing like C3PO; there was no person inside to move the character about, so all scenes with Kamelion involve him sitting or standing very still, often leaning against a wall. I’ve always thought that having a shape-changing character written out was weird. Why not just recast an actual human, or indeed multiple actors to play the part? Or in the case of Big Finish, an actor who can play multiples characters? 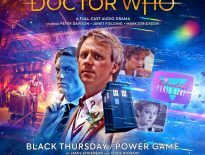 The impressionist, actor, and massive Doctor Who fan Jon Culshaw plays Kamelion in the latest Fifth Doctor Trilogy from Big Finish. He is joined by regulars, Peter Davison, Janet Fielding, and Mark Strickson playing the Doctor, Tegan, and Turlough respectively. He fits in perfectly with the existing cast and is able to bring new life to a character that was almost a blank slate. The first story in this trilogy released is Devil in the Mist by Cavan Scott. A story where the TARDIS crew are accidentally aboard a spaceship when a dangerous criminal, Nustanu is released while the ship is about to crash into a planet of mist. They must survive the crash and hunt down the villain who can turn into mist and blend into the planet. It is not very surprising that Cavan Scott, the writer of many Doctor Who comics, has created a very visual story. If this were an episode on TV or a comic book then it would work wonders. However, I think that the constant explaining about the environment goes on a little too long. Some dialogue is a little clunky in high energy scenes such as a big fight sequences near the end. There are certain limitation to audio that cannot be overcome. When a race of hippopotamus people are introduced fairly early on, you do have to have a character say ‘hey look, hippo people’. This quickly gets you over the hurdle of character descriptions and the story can move on to talking about their culture. They are a fun race who have appeared in Doctor Who before. It’s an image that is easy to understand – pleasingly, very visual for an audio. The planet the survivors find themselves on is full of dangers, both internal and external. They do not know what hides in the fog, neither do they truly understand Kamelion. The android is prone to being influenced by strong psychic forces, with the possibility of him being controlled by Nustanu an ever present danger. I was unsure what Big Finish’s take would be on Kamelion and whether the company would explain why he was simply hidden away in the TARDIS for much of the TV series. Scott and the other writers of this trilogy seem to focus on Kamelion’s lack of control of his own abilities. Like Turlough before him, there are questions as to whether he can be trusted. This first story leaves you guessing right up to the end, with a twist that I didn’t see coming. I think it is a very good idea that the audios are focusing on Kamelion’s mental state rather than just on his ability to change his appearance. In fact, throughout the trilogy, he spends more time in his shiny robot form than I thought he would. I submitted a story in which Kamelion met the polymath who created the concept of a digital programmable computer, Charles Babbage to the Paul Spragg memorial Completion last year; I did not win, but I am glad to see that it wasn’t because I had had a completely terrible idea. Culshaw’s impressions mean that there is not always a different actor playing Kamelion when he changes form. I think this preferable to having to keep a mental track of who he looks like at any given point. It also makes the times where he is being played by a different actor more impactful to the listener. Big Finish is using its 20th anniversary year to delve into corners of the Doctor Who universe that they haven’t engaged with before. This Kamelion trilogy gets them off to a good start. 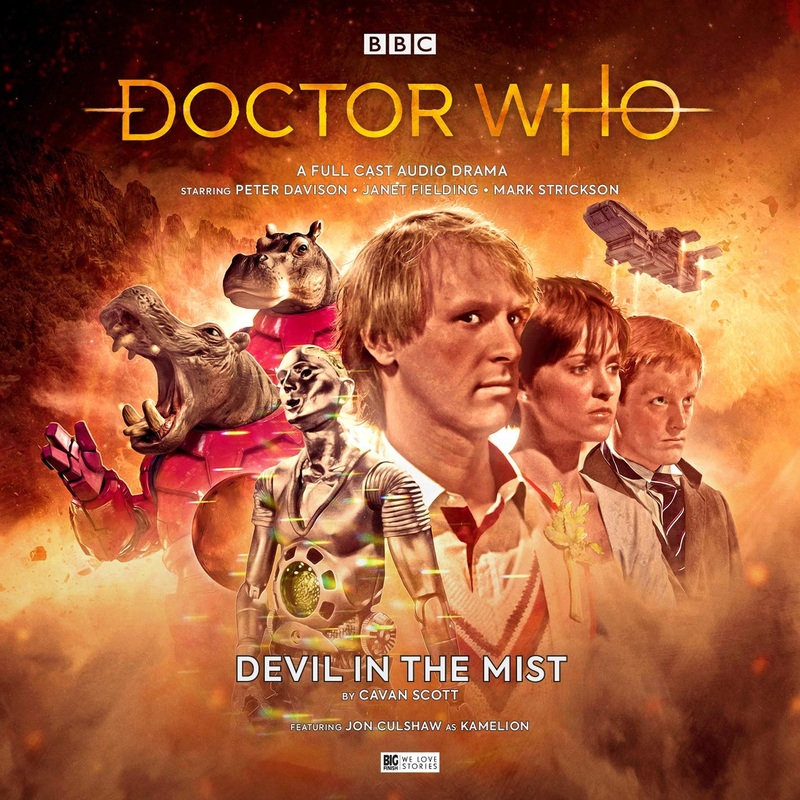 The Devil in the Mist is available from Big Finish on for £14.99 on CD and £12.00 on Download.